Politics • Campaign says candidate's parents immigrated legally with visas, but won't get into details. 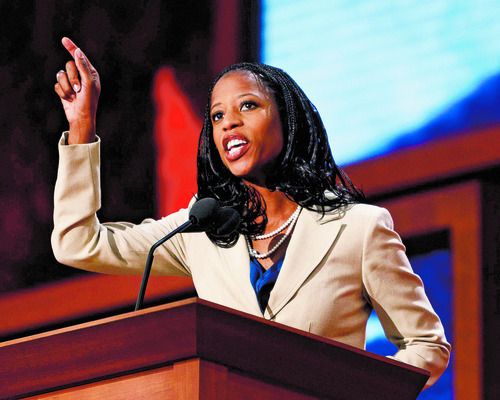 Trent Nelson | Tribune file photo Utah congressional candidate Mia Love, shown here at the recent Republican National Convention, says Congress has to get serious about cutting the deficit -- and that means reducing bloated budgets and programs. Everywhere she goes, congressional candidate Mia Love tells the story of her parents, who fled persecution in Haiti, settled in the United States with $10 in their pockets and instilled in her a sense of self-reliance. But questions have surfaced about the narrative and how her parents and siblings gained their citizenship. In an interview in early 2011, Love said her parents were forced to leave her older siblings in Haiti when they moved to the United States. Under an immigration law that she said was due to expire in 1976, they would have to return. But she was born in December 1975, 25 days before the law lapsed. "My parents have always told me I was a miracle and our family's ticket to America," she told the Deseret News last year. Her parents reunited the family in Brooklyn, and her parents gained their citizenship. On Monday, the liberal-leaning magazine Mother Jones questioned whether the story indicates that Love could be what is derisively referred to as an "anchor baby," born as a citizen of the United States and conveying citizenship to the parents  although in reality the process is far more complicated. A statement to The Salt Lake Tribune from the Love campaign Monday did not elaborate on the specifics of her parents' journey, and the campaign refused repeated efforts during the past month by The Tribune to arrange an interview with her parents to tell their story. "Mia is proud of her immigrant background and that of her parents who came to the U.S. with legal visas," the campaign said in a statement. "Mia's parents then earned the right to become U.S. citizens. … Mia's parents didn't take a handout and taught her not to be a burden to society, and to give back. She is blessed to live in the greatest country in the world and she is making the most of the American dream." It is unclear what program was slated to expire that would have forced the family to return to Haiti. There was a flood of immigrants fleeing Haiti in the 1970s, but several law journal articles say they were less likely to be granted asylum than counterparts from Cuba. At an event last month, Love told a story about how her father, who had gone to the movies, was chased through town by the Tonton Macoutes, the select security service for Haitian dictator Francois "Papa Doc" Duvalier, until he hid in a drainage pipe, where he stayed overnight. Love's grandmother thought her father had been killed or taken by the militia. Love said her father told her, "I took the first legal pathway out, got a visa, went to the United States, decided to have my family there … because I never wanted to have those fears and I never wanted my children to have those fears." Rep. Jim Matheson said it is hard to know what the details of Love's story might be. "To the extent that her family story is sort of the central foundation of the campaign, if there are questions out there, I think they ought to be answered," he said.